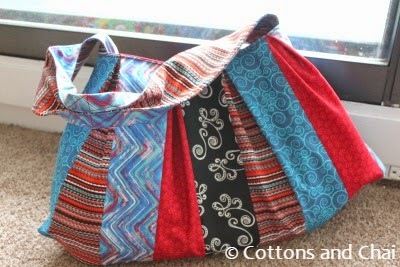 A couple of months ago I was excited to receive an email from a lovely lady about a custom bag she would like to order. 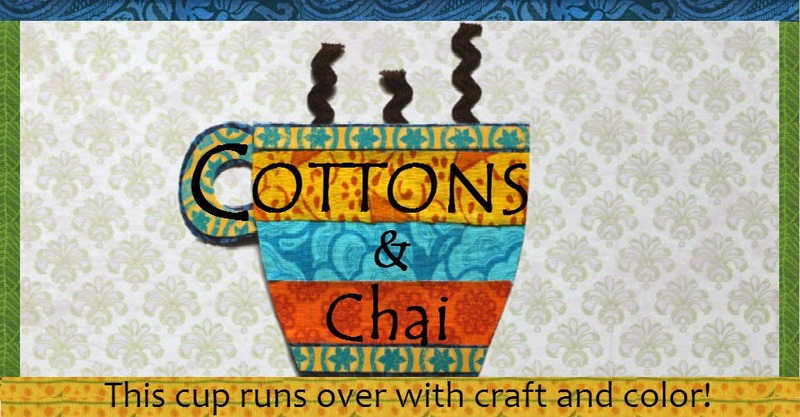 Now, it is always a pleasure to make custom designs for people, to incorporate all their dream features and endeavor to hand over exactly the product they'd love. Needless to say, I was very grateful to know her preferred features and colors (red, blue, black) and especially the nagging problem she's faced with handbags earlier - lining/ pockets tearing from the inside under the weight of her keys. I'm glad she pointed this out, because then I took special care to reinforce pockets. I remember when I first drafted this pattern for a pleated tote. 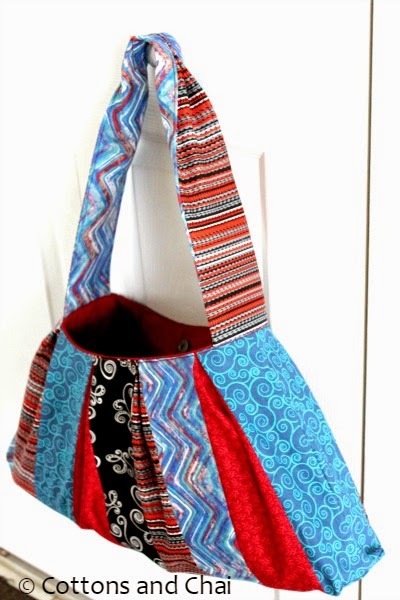 It was in my early days of sewing and my living room was full of newspaper pattern pieces, with trial after trial to get just the right sized bag. 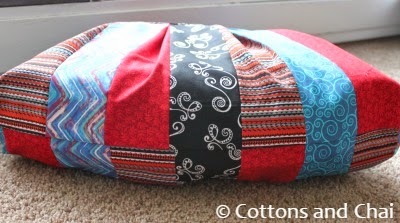 The most fun part of making a bag with this pattern is pulling the fabric combinations. I went on to sell a few of these colorful bags subsequently at college fairs, exhibitions and for a short duration at my etsy store. So I began with a trip to the fabric store to pull the best combination I could of reds, blues and blacks and ended up going with all three. 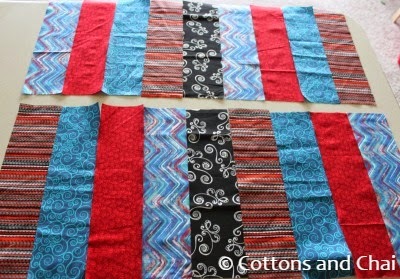 Next I cut strips from all the fabrics and set them up in an asymmetrical way just to make it more interesting. I sewed them together and added the pleats to the front and back. 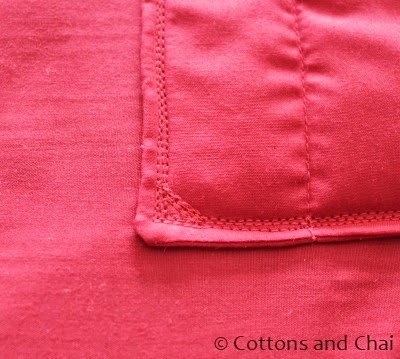 Then I prepared the pockets and added them to the lining. I chose a heavyweight black interfacing because the bag needed the structure to take the weight of those notorious keys! 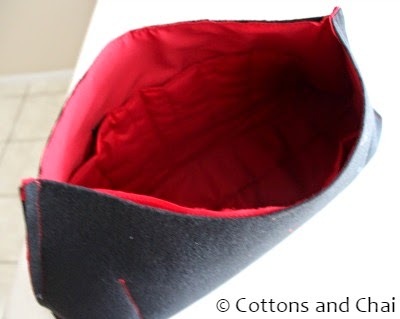 I triple stitched the pockets to the lining and also made triangular corners for added reinforcement. Bring it on keys! Here's the inside of the bag put together. 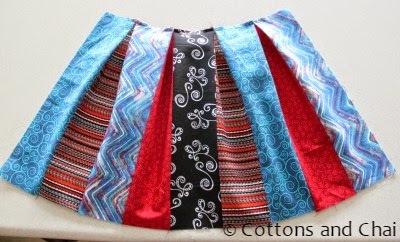 Similarly the outside sewn together. 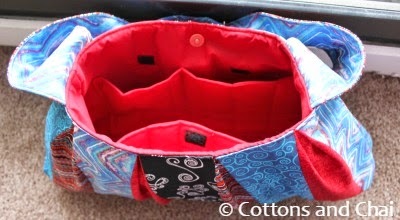 Then I sewed the handles, added the magnetic closure and sewed the roomy bag together. I'm thrilled to say that my charming customer was very happy with it and I'm so glad I bagged her order :D.
Too cute- I love it! !